TSS Sailing - GPS Champions! 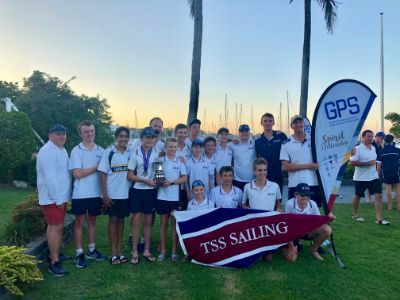 Last Sunday saw the TSS Racing Team achieve the remarkable feat of a sixth successive GPS Sailing Championship, with a tightly fought win in the GPS Regatta at Royal Queensland Yacht Squadron, Manly. As has been the case in previous years, the level of competition in this regatta was significantly the highest of the season, with the best sailors from Brisbane Grammar School and Brisbane Boys College providing a real challenge for our boys. In addition, crews from non-GPS schools including Iona College and Somerville House were also very competitive. Sailing was delayed early due to light winds, however the breeze strengthened throughout the day allowing six races. Blake Wilson and Lachlan Free were the only TSS crew to win an individual race during the day, being successful in the first race. Our boys at times found the congestion on the start line challenging to negotiate, however, their overall speed and greater consistency throughout the course of the day proved invaluable. When the regatta concluded, Blake Wilson and Lachlan Free finished in 2nd place, followed by Tom Wright and Zach Miller-Wright in 4th place and Angus Wheatley and Andy Douyere in 7th place from a fleet of 34 boats. This gave the TSS First VI the overall first position. Overall it was a fantastic and hugely competitive day of sailing. The boys all conducted themselves in a wonderful spirit and were genuinely supportive of one another. Coaches Xavier Doerr and Connor Pilcher were deservedly proud of the way in which the boys had trained for this day and the depth of talent for the future was very evident. Many thanks are also due to Mr Mark Lockett for his team management and the ever present support of the Friends of Sailing, and the large number of parents who came to support and ensured that the boys were fed and kept hydrated throughout the day. As always, the strength of our community was very evident. The term's sailing concludes with the final TSS Regatta on Saturday morning, and the Sailing Presentation Dinner later that evening. We look forward to a final great day of sailing for the term.